The former Aston Villa and Tamworth midfielder, Daniel Bradley, joined the Harriers at the start of the January 2012 transfer window following his release from Tamworth during the previous month. Although never making an appearance for Villa he made over sixty during his eighteen months with Tamworth but chose to leave them following a disagreement with the Lambs manager Marcus Law. His time at Aggborough was short after he declared that he wanted to be starting every game. Even when injured it seemed. This didn’t go down too well and he left us for Alfreton Town six months later. There then followed one of the strangest incidents in football when Alfreton transferred him to Barnet at the end of the 2013-14 season but by the time the next season started Bradley had returned to Alfreton stating that he was homesick. He then signed for AFC Fylde two years later for an un-disclosed fee but didn’t settle there either. 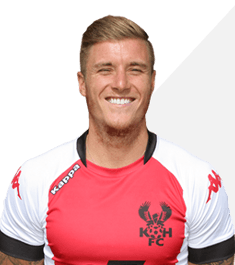 He re-signed for us in August 2017 on a three year deal for a fee of £75,000. In January 2019 he returned back to Fylde intimating that he was leaving a sinking ship that was in disarray.